59 days to harvest. Perfectly round beets 3" across. Dark red, extremely sweet flesh. Medium size tops. 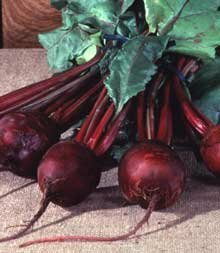 These beets are great for the root and the leaves. Leaves can be cooked like spinach and are very tasty. Beets are mild and sweet and tender. Plant as soon as soil can be worked. Also excellent for summer or fall crops.